Really dig the bulkyness of this conversion! 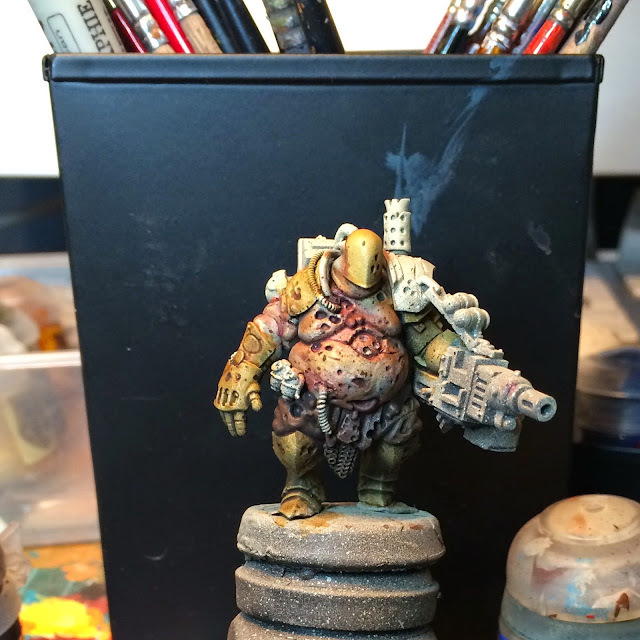 I've followed your blog for a bit and I really love your work (both painting and modeling). You've inspired me to try and use more washes then I had previously, because I really appreciate the 'real' feeling that you seem to capture. I believe this is a result of your washing process (at least on a basic general level, obviously it takes understanding far beyond this component to produce all of what you accomplish). One hindrance for me is often my washes pool funny (often leaving 'water rings' or with splotchy, inconsistent coverage) do you add something or have a method you use to counteract this in some way? Btw I really enjoyed your 'painting of the face' step by step you posted. Thanks and may your brush never fray! Thank you for the tips! May I ask which 'new inks' you were referring to? I refer to the GW washes that has been around the last five years or so. Back in the days they were called inks and had slightly different properties. Thanks, I thought that's what you were probably talking about as I've had them dry with the white film as well, but I wanted to be sure. I still have some of the old inks :) Perhaps I'm over-thinning them? I would imagine that could get the funky coverage and water spots. Almost right there, mysterious poster, however: the gun is a cut down big shoota from the deff dred kit and the helmet is not dark eldar, rather one of the faceplates from the blightking kit with the horn cut off. I am reading False Gods (2nd Heresy book) where Horus fights Eugan Temba. Nurghleth - This is Temba reincarnated. Alright - haven´t read the HH books so I have to take your word for it!